Chicago Department of Water Management Employees at Shakman Decree Speak up. CHICAGO — A federal judge on Thursday approved a sweeping blueprint for ending the century-old practice of hiring Chicago city employees based on political clout, admitting it might not work but expressing hope. “I actually have hope, rooted in a lot of efforts over the last several years, that things will actually change,” Judge Wayne R. Andersen told attorneys, some of whom have been bickering for three decades over Chicago’s time-honored but illegal system of filling city payroll jobs. E-mail this story Printable format Search archives Andersen’s approval of the plan, signed by Mayor Richard M. Daley on April 11, had been expected and came as a formality. Under the plan, the city agreed to establish a $12 million fund administered by a court-appointed monitor to compensate victims of unfair hiring practices. It empowers the city’s inspector general, currently former federal prosecutor David Hoffman, to investigate any violations. The court-appointed monitor, attorney Noel Brennan, will continue to oversee city hiring and report her findings to the judge. The city may ask the court after 2008 to terminate the plan and Corporation Counsel Mara Georges said it intends to make such a request. At the heart of the dispute is the age-old, political machine-style practice of reserving city payroll jobs for political appointees. Most patronage hiring is banned under a 30-year-old federal court decree in a lawsuit filed by attorney Michael Shakman — who was beaten in a race for delegate to the 1970 Illinois Constitutional Convention and blamed his defeat on an army of campaign workers on the city payroll. Critics of the system maintain that insurgent candidates can rarely win against an army of campaign workers who have city jobs but whose real work is to assure the election of the mayor and his political allies. Four city workers were on hand to grumble that the blueprint for change fails to go far enough. Andersen assured the employees that the city can’t unilaterally scuttle the blueprint but must first win court approval to terminate it. He told the city workers, who plainly remained disgruntled, that the best course for them would be to “get involved” in efforts to bring reform. That brought a roar from the spectators. The patronage system has been at the heart of Chicago politics since the 19th Century. It used to mean assuring city jobs to doorbell-ringing, favor-doing precinct captains who got out the vote for their ward committeemen. That system was banned by the Shakman decree, although it has been obvious for decades that politically connected candidates still were getting hired in large numbers, regardless of court restrictions. 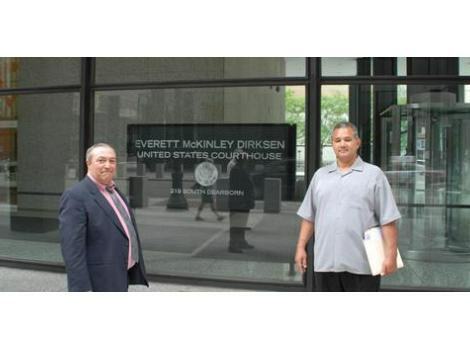 Four former city employees, including Robert Sorich, widely known as Daley’s patronage chief, are currently appealing their convictions in a federal trial on charges involving a scheme to flout the restrictions. The federal investigation showed that the system has changed since Daley took office and that much of the patronage has been centralized in key city departments rather than being doled out to ward committeemen.